A program to integrate ROS-Industrial with the machine tool platform MTConnect is getting a boost from a grant through the National Institute of Standards and Technology (NIST). The recent grant builds on a 2013 prototype application developed by a team of companies led by the National Center for Defense Manufacturing and Machining (NCDMM). That effort resulted in a successful application demonstration with testing by NIST manufacturing researchers, providing the framework for a “generic bridge” to break down the well-documented language barrier in factories. In effect, the work to date, and moving forward is simply a translator that converts data and messages written in two languages—one popularized in the robotics open-source and research community, ROS/ROS-Industrial, and the other by the builders of machine tools, MTConnect—into a form that both can leverage. www.MTConnect.org | www.rosindustrial.org The system design used in the demonstration enabled peer to peer communications between the robot and the machine tool utilizing MTConnect and ROS-Industrial. Sponsored by the National Institute of Standards and Technology (NIST) and managed by the National Center for Defense Manufacturing and Machining, partnering with System Insights, Southwest Research Institute and AMT - The Association For Manufacturing Technology. This work set the foundation for the new NIST grant and an alliance between Southwest Research Institute (SwRI), the Association of Manufacturing Technology (AMT), and System Insights. 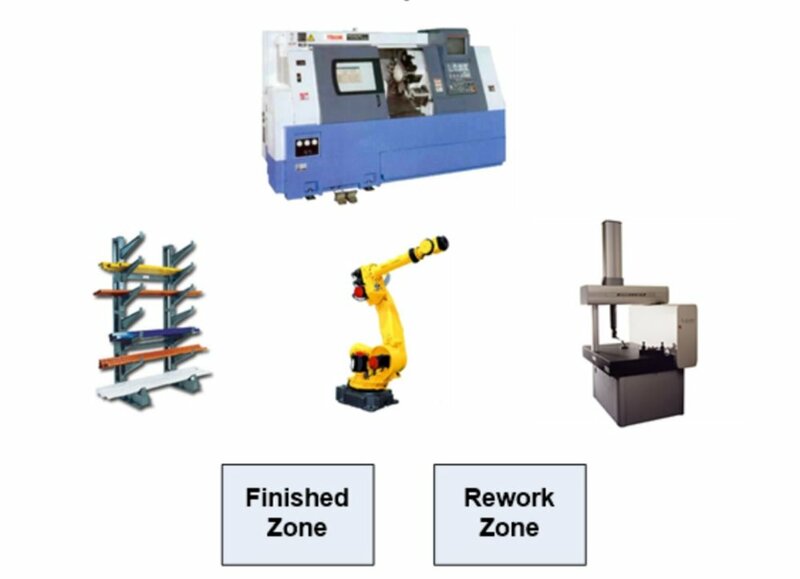 The initial project demonstrated the ability to implement ROS-Industrial to program a robot and use MTConnect protocol for communications between the robot and a CNC machine tool. Similar to the previous effort, this new initiative is primarily software-based and will use the open standard application level protocol, MTConnect, and open-source ROS-Industrial to enable facility-level interoperability between robot teams and machine-cell devices, facilitating a “many-to-many” relationship. The expansion of the ROS-I/MTConnect solution further enhances the viability of using industry-supported, open-source software for smart manufacturing applications. Open-source software permits a continuation of free development over a very large development workspace that ultimately solves complex problems where the solution is free to the end user. The output from this project is intended to be an enabler for industry-wide adoption of open-source technologies by providing a use-case and testbed showcasing lower cost solutions for comprehensive factory floor integration for small- and medium-sized manufacturers. A test-bed will be developed with an eventual demonstration to be unveiled at IMTS, within the Emerging Technology Center, in the fall of 2018 in Chicago. This will highlight a lean implementation, leveraging the latest software developments by the team, and highlight the advantages of the many-to-many approach, leveraging open-standard and open-source tools. This also extends the open standards/common communication paradigm of supporting work cells that have historically been a single stationary device, to multiple interconnected devices, and potentially swarms of devices in the mobile/dynamic environment of the future.